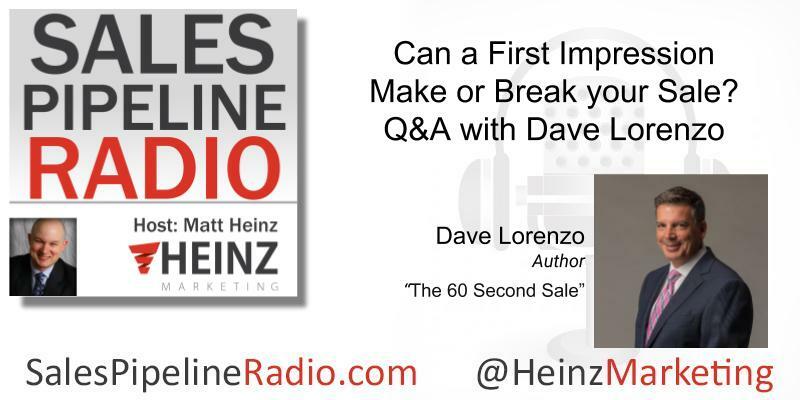 In this episode, we talk about Dave Lorenzo's new book, "The 60 Second Sale" and a lot more! A lot of B2B sales professionals are doing long term, complex sale efforts, "The 60 Second Sale" sounds a little like "12 minute abs." I ask Dave "Is it really that easy? Can you really do it this quickly?" "The 60 Second Sale is about creating a condition under which, if your best client, the person who trusted you most in the business world, had a need and you called them up, it would only take you 60 seconds to close that deal. So, if you are adding value to somebody who already trusted you, you could close a deal in 60 seconds if you met those exact conditions. The book is about creating those conditions every single time. It's about taking what everybody would think of as a one-call close environment and making the relationship the one-call close." "Another way to look at it is to take the individual moments of truth that occur throughout the day with our clients and with the evangelists who are out there recommending our services, and winning each of those individual moments of truth. So, you create an environment that is one of trust, and you make sure that you're always focused on the wants and the needs of your clients, and you can close a deal in 60 seconds." Listen in to hear Dave's thoughts on how to build the relationship, to create those conditions and needs. He talks about the things required to create differentiation, separation in what can be competitive markets. 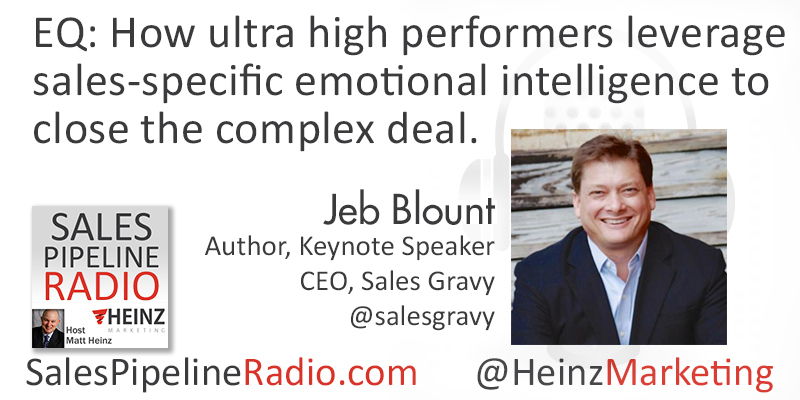 Check out the full transcription and recording on the Heinz Marketing blog starting Mon. 9/24/18 6am PST. 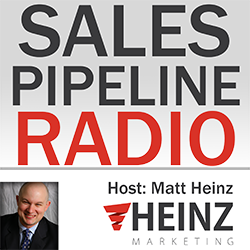 Join host, Matt Heinz and his guest, Anthony Iannarino as they review Anthony's book, The Lost Art of Closing. Amazon reviews show 4.9 out of 5 from 96 reveiws. Why clsoing isn't the most difficult part of a sale. The key is to lead customers through a series of necessary steps designed to prevent a purchase stall. The Lost Art of Closing will help you win customer commitment at ten essential points along the purchase journey. You’ll discover how to compete on value, not price, by securing a Commitment to Invest early in the process. How to ask for a Commitment to Build Consensus within the client’s organization, ensuring that your solution has early buy-in from all stakeholders. Why so much emphasis on change? How to prevent the possibility of the sale falling through at the last minute by proactively securing a Commitment to Resolve Concerns. They will also talk about CEB, changes in sales, and how sales now requires better marketing. 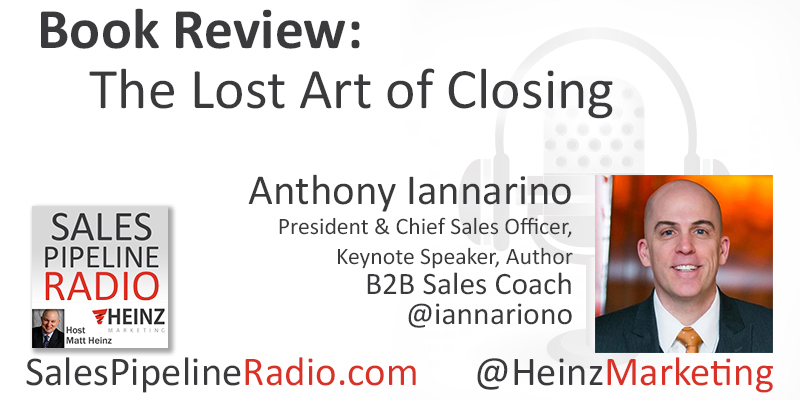 Join host, Matt Heinz and his guest, Anthony Iannarino as they review Anthony's book, The Lost Art of Closing. He'll have some insights that will help you close more deals. 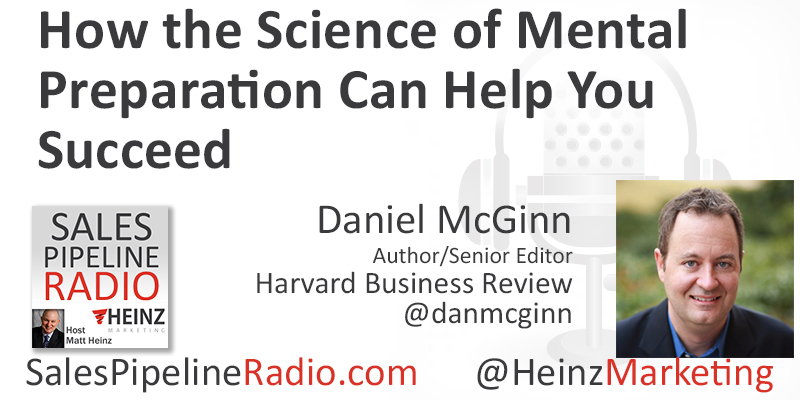 Matt welcomes author and Senior Editor of the Harvard Business Review, Daniel McGinn to talk about his new book, "Psyched Up: How the Science of Mental Preparation Can Help You Succeed." The book looks at the science and practice of how professionals can learn to use techniques used by Olympic and pro athletes to get in the right mindset before they perform. Chapters look at the use of pep talks, motivational music, trash talk and rivalry, techniques to boost confidence and reduce anxiety, and even drugs to help you get in the mindset to perform. If your job involves pitching ideas, high-pressure negotiations, public speaking or presentations, or make-or-break sales calls, the techniques in the book should help people bring their A-game. The book has only been out a few weeks, but I've started hearing from companies such as Oracle that are buying the book for their sales teams because they think the ROI for people who learn these techniques is obvious. I'm also hearing from entrepreneurs who agree with Brad Feld, who said "This book is a gift for entrepreneurs or anyone else who pitches ideas for a living." Are you fanatical about prospecting? You should be! Matt's guest in this episode is Jeb Blount. Jeb Blount is a long time sales trainer, prospector and the best-selling author of eight books including Sales EQ, Fanatical Prospecting, People Follow You, People Buy You. He is a Sales Acceleration specialist who helps organizations reach peak performance fast by optimizing talent, leveraging training to cultivate high-performance sales culture, developing leadership and coaching skills, and applying more effective organizational design. When Matt asked how the salesforce looks today he suprised us with his answer, "It looks the same as it did three years ago, five years ago - the things sales people are doing are the same things they did then. But, there are more ways to fill your pipleline and channels - more opportunities than ever before. Older salespeople are benefitting, but can be overwhelmed with the addition of so many places to interupt the day of prospects and connect." Channels are being clogged, though, because they are so readily available. Matt asked, "How do you break through using these tools?" Jeb tells us, "It's always been hard to break through, even when we had email and door knocking, before social became core channels. Prior to that - doors, phones and networking events." Listen to this - the story of Richard from the UK and how he was persistent until he got through. He KNEW Jeb was a buyer, he KNEW. It's a great success story of knowing your target market and not giving up. Through his companies – Sales Gravy, Channel EQ, and Innovate Knowledge - he advises many of the world’s leading organizations and their executives on the impact of emotional intelligence and interpersonal skills on sales, leadership, customer experience, channel development, and strategic account management. Under Jeb’s leadership Sales Gravy has become a global leader in sales acceleration solutions including sales recruitment and staffing, sales on-boarding automation, custom sales training curriculum development and delivery, sales coaching, and online learning. As a business leader Jeb has more than 25 years of experience with Fortune 500, SMBs and start-ups. He has been named one of the top 50 Most Influential Sales and Marketing Leaders (Top Sales Magazine), a Top 30 Social Selling Influencer (Forbes), a Top 10 Sales Experts to Follow on Twitter (Evan Carmichael), a Top 100 Most Innovative Sales Blogger (iSEEIT), a Top 20 must read author (Yes Magazine & Huffington Post), and the most downloaded sales podcaster in iTunes history; among many other accolades. His flagship website, SalesGravy.com, is the most visited sales specific website on the planet. Matt's annual, "What he read in the year" episode is here. This is a great place for a filtered reading list. Some familiar authors in this list and some you may not have had a chance to read. I love the One True Barbecue and how it applies to business. Have recommendations? Add them in the comments. Anything on the science of influence is absolutely fascinating to me – whether it’s about influencing fans, customers or myself. Cialdini’s book Influence is a classic, and this sequel/prequel is a must-read to understand how your sales team (and marketing/content teams) can set the conditions for influence and conversion better in 2017. 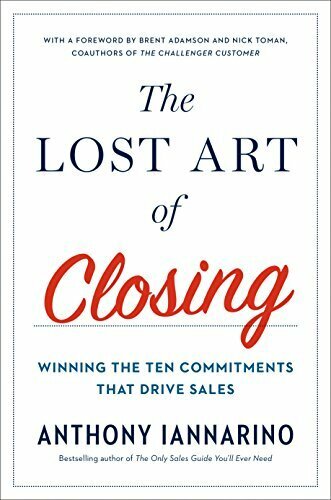 If it weren’t for all the other great sales books on the market (this year and in recent years), I’d say the title of this book is 100% the truth. Anthony is one of the very best sales bloggers and speakers working today, and this book summarizes much of his very best advice. I highly recommend expanding your sales library, but if there is just one book on the shelf, this should probably be it. A fascinating and fast read, with numerous business lessons included. What differentiates a trend from a fad? How can you tell you have something sustainable and repeatable? The story of the rise and fall (both fast & dramatic) of the Beanie Baby craze is chronicled with a great combination of business advice and juicy insider stories. A fun read with value. The most important, eternal, fundamental sales skill is prospecting. Whether you’re working ice-cold leads or warm inquiries from your marketing team, you’re still prospecting. Activity and volume isn’t enough. This book features new trends and research, plus a proven framework of habits to accelerate your sales pipeline-building results in 2017. Every one of Jill’s books have been fanastic, but this might be her best yet. She’s previously covered how to work with crazy-busy buyers, now she addresses the problem every single sales rep I know has – how to make best use of their time to increase active selling time, external impact and results. I’ll give away the punchline – according to Rein, the only “true” barbecue is 1) whole hog, 2) cooked over wood in 3) a masonry pit. A difficult combination for amateur BBQ enthusiasts to replicate, but this amazing book covers the history of whole-hog BBQ while simultaneously covering the history and anthropology of the Carolinas. If you like BBQ or history or good story-telling, you’ll like this book. What separates this book from so many other business autobiographies is its focus, candor and detail. It’s not an ego-driven puff piece, nor does it sugar-coat what growing a business is like. The book starts with Phil’s inspiration to start the business, and ends before the IPO. In between, he highlights the numerous times Nike almost didn’t make it, almost ran out of money, almost went out of business – yet somehow figured out (or stumbled into) how to keep moving forward. It's a story of humility and gratitude. One of the best books I’ve read on the real story of entrepreneurship in a long time. This book was originally written in 1984, but I re-read it earlier this year to reinforce Eli’s Theory of Constraints. Think about your business today – what’s the #1 constraint keeping you from growing, that when alleviated would help everything else work more efficiently? This book is a great example of business fiction (if you’ve read Five Disfunctions of a Team, you know the format). This book is a differentiator. It covers what all too often is a lost art of habits, manners, mannerisms and more that get noticed, differentiate you as someone special, and can material help you win more business. Maybe not on your “mainstream” business reading list but it should be. Published as a set of letters to a struggling and fellow former SEAL, this book pulls deeply from ancient literature and lessons on what resilience means, how it applies to our lives, and how to apply it to make ourselves better – personally, professionally and in all points between. This is the last book I read this year and might be my favorite of the bunch. "The Path to Success: There is no elevator, you have to take the stairs."